Adventurous tourists, get a new perspective on jungle life! 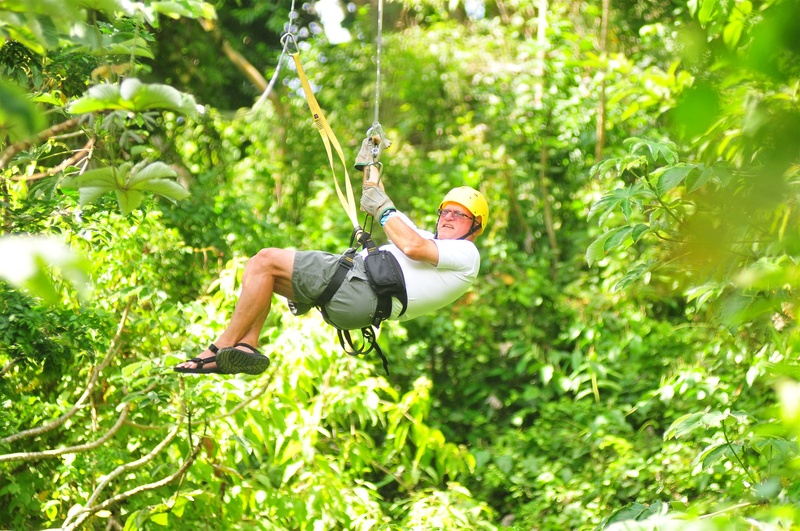 Enjoy a thrilling soar through the treetops of Roatan, Bay Islands, Honduras with Canopy Tour of Gumbalimba Park. Zip from tree to tree high above the lush jungle floor. 13 exciting traverses will take you all the way from the top of Roatan's mountainous backbone to the middle of the beautiful sandy beach of Gumbalimba Park, West Bay. Surrounded by magnificent foliage alive with tropical wildlife, you'll be tempted to let out some Tarzan yells when you take the "leap of faith." But with double line cables, expert guides, and mountain-climbing gear fastened about you and heavy gloves, you'll have more peace of mind than on Tarzan's swinging vines! Monkey Trail Canopy at Gumbalimba Park begins at the top of Creation Rock at the top of Gumbalimba Park. So as your driving on the West Bay Road, you'll see the entrance to the canopy on the right of the roadside about 1.5 miles before Coxen's Cave. The tour consists of 17 different platforms with two shorts walks. After gearing up and listening to a brief explanation of safety features and techniques, adventurers take off from the briefing station to the first tree platform located about 60 feet high.